No matter where you read Grape Sense, odds are you occasionally travel to Indianapolis. Next to wine recommendations, I probably get asked as frequently for fun and interesting dining options in our state’s capital. There has been a real revolution and emergence in fine dining in recent years. 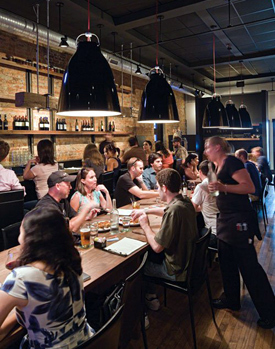 Chef-driven restaurants are the craze across the nation and certainly in downtown Indianapolis. I’m offering just four options with descriptions here. These are spots I’ve dined once or several times. 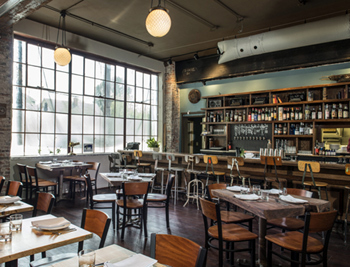 Bluebeard’s casual and hip dining room. Bluebeard, 653 Virginia Ave., in the Fountain Square district is probably my top choice. 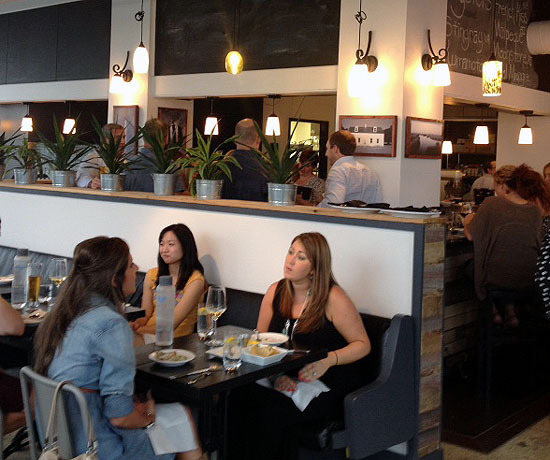 Chef John Adams started this hot spot but has now moved on. The restaurant tantalizes in a setting inspired by Kurt Vonnegut. Lots of snacks, charcuterie, sides, soups and small plates get the diner started. The choices then come down to small, medium or large plates. It’s a perfect place to mix, match and share with your fellow diner. Small plates run $10-$18 featuring sashimi, frog legs, and usually a salad among the choices. The $14-$40 medium plates offer up Halibut, Ceviche, Octopus and foi gras. The large plates, $26-$42 are exciting. Current large plates are a killer Pici with Bolognese. Lamb loin, skirt steak, and a ribeye Portobello are on the current menu. Black Market, 922 Massachusetts Ave., is a smaller spot on the opposite end of downtown. There are some similarities between Black Market and Bluebeard. The menu is smaller than many spots. Starters of pate’, salads, beef heart or lamb tongue range around $10. Dinner runs in the $20-ish range with trout, brined pork chop, chicken, and crispy duck leg confit currently the star attractions. One of the things I appreciate most about these spots is a growing wine list. Both offer a wide variety of wine styles, regions, and price points. The wine-by-the glass offerings are much more diverse than I find in most restaurants and even other cities. Remember full bottles of wine will usually be marked up 100 percent and that’s why wine-by-the glass represents a real bargain. With a bottle of wine, dinner for two at either of these places can easily reach $125-$200 plus tip. So how about something a bit different? Indianapolis has lost two long-time French restaurants on the city’s southside in recent years. But there is a new bistro on Mass Ave. sure worth a visit. The other spot is good for dinner but I think even better for a lunch – and a great buy. Cropichon et Bidibule, 735 Mass. 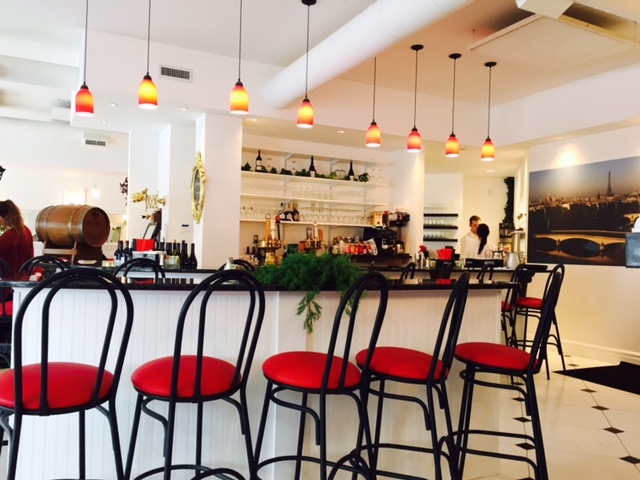 Ave., One of the newest entries in Indianapolis is this French couple’s bistro on the popular Mass Ave strip. Never mind the restaurant’s name, no one else can pronounce it. It’s actually French gibberish nicknames for the owners’ children. The specialty is crepes – sweet and savory and wow they deliver! The pricing for the crepes is very reasonable around $10 or less. 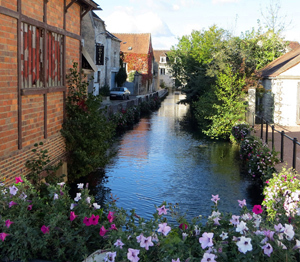 The dinner menu features contemporary French classics like duck and boeuf bourguignon. The wine list is mostly French, no surprise, but a large selection of French wines by the glass. UPDATE to newspaper column: I dined here just a few days ago and dinner surpassed the lunch.! Mimi Blue, 874 Mass. Ave does lunch and dinner. The city’s new meat ball restaurant has really taken off. 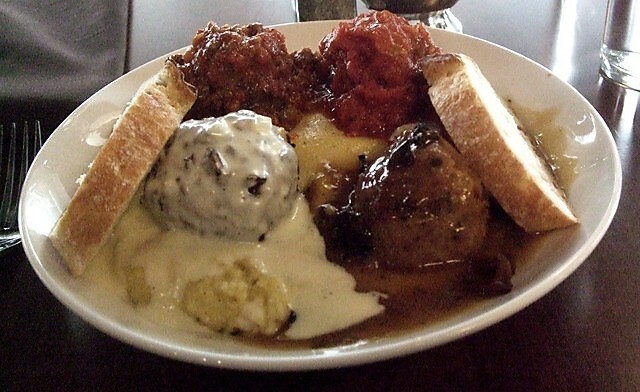 Classic, Turkey, Veggie, and Beef meatballs are always on the menu. But you’re also likely to find another meatball or two of many possible international origins. The price is right too. You can choose a four-ball plate with a choice of sauces for $11. The side dishes of linguine, polenta, white beans, and potatoes are equally great. Mimi Blue had a more limited wine selection that didn’t excite me, but plenty of choices. There are so many great choices beyond the four offered here. It’s also exciting to see real diversity come to Indy’s wine lists. Perhaps we’ll revisit restaurant recommendations in a future column.